1 of 7 Beat shortening and sugar in a large bowl with an electric mixer on medium-high speed until well combined. 2 of 7 Add baking powder, baking soda, salt, ginger, cinnamon and cloves and beat until blended. 3 of 7 Add the egg, molasses and white vinegar and beat until smooth, scraping down the side of the bowl once or twice as necessary. 4 of 7 Add flour, 1 cup at a time, and stir until incorporated. Scrape the dough onto a sheet of plastic wrap and press into a rough square. Wrap tightly and refrigerate for at least 3 hours and up to 3 days. 5 of 7 Heat oven to 375 degrees F. Line a baking sheet with parchment paper. 6 of 7 Cut away one-fourth of the dough and rewrap the rest. With a floured rolling pin, roll out dough on a generously floured work surface to 1/4-inch thickness (dough is soft). 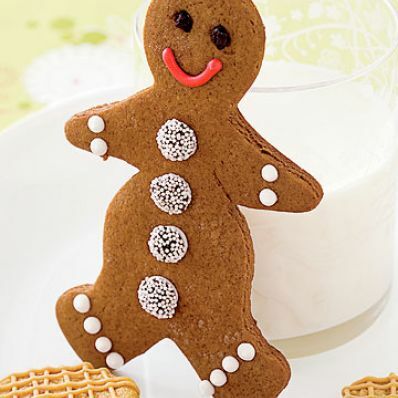 Cut out gingerbread people with cookie cutter; place them on prepared baking sheet using a large metal spatula. Refrigerate scraps. Make eyes, nose, mouth and buttons by pressing raisins, chocolate chips and/or candies into cookies. If you wish to make ornaments, cut out a hole at the top of each cookie with a drinking straw. 7 of 7 Bake cookies at 375 degrees F until firm, 8 to 10 minutes. Slide parchment sheet with cookies onto a wire rack and let the cookies cool completely. Repeat with remaining dough, then with chilled scraps, using fresh parchment paper each time. Decorate with icing as desired. Let dry completely. Keep at room temperature in an airtight container for 7 to 10 days. Per Serving: 6 g Fat, total, 155 kcal cal., 25 g carb., 2 g pro., 118 mg sodium, 1 g fiber, 1 g sat. fat, 11 mg chol.